Gingy Jr was born! I love how this cutie turned out :) When the girls woke up the next morning, I brought out Gingy and Gingy Jr, and they were happy as could be. All gingerbread-induced fighting ceased. Each girl carries around her respective Gingy during the day and sleeps with her Gingy at night. My oldest understands that Gingy goes away after Christmas and won't be back until next December, but it will be interesting to see how my youngest reacts to putting Gingy Jr in a box headed for the basement in a few weeks. Have you voted in the Pink Chalk Studio Handmade With Love Tutorial Contest? My pencil pouch is a finalist! Voting ends tomorrow, 12/21. Gingy is too cute! I hope they understand that it's only for Christmas time. My children get a nutcracker each year, which seamed like a good idea when we started -- I never thought about the amount we'd accumulate over the years. It's already getting crazy! They look forward to seeing them each year!! It makes it really special. It seems like I am always having to produce more than one of something to reduce fighting. 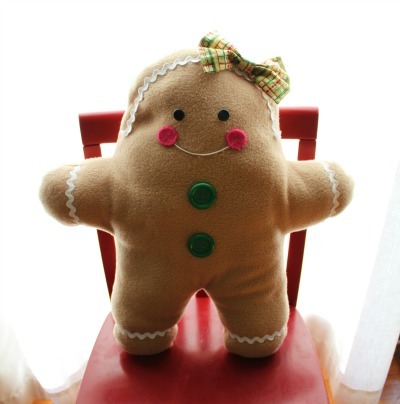 Gingy is adorable. "It's so fluffy I'm gonna die!!" I love this, and it's really adorable! I have a small collection of stuffed animals that hang out under our tree until Santa arrives, and this would fit right in. Very cute. Perhaps it wouldn't hurt to keep gingy out for a bit past his "bedtime". Have a great Christmas. Gingy is so cute! I love the idea of them only visiting for December--keeps them special and they won't get lost under the bed or will keep them good looking for longer. 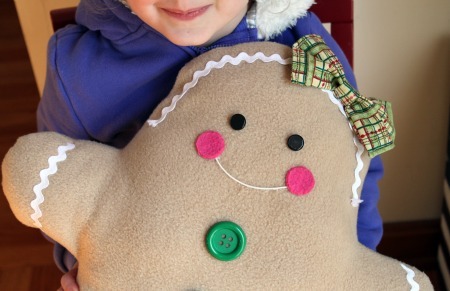 OMGoodness..we had a Gingy too!! I completely forgot about that. It was second daughters (she's now 31) and she carried that thing everywhere..it even needed to be seatbelted into the car on trips! Thanks for the trip down memory lane..
Aww, she's so cute! That's a really great tradition to start...something for me to keep in mind for next year! aww how cute. I would want to keep her all year as well! The cutest doll I have ever seen! Amazing! Oh goodness that's just darling! 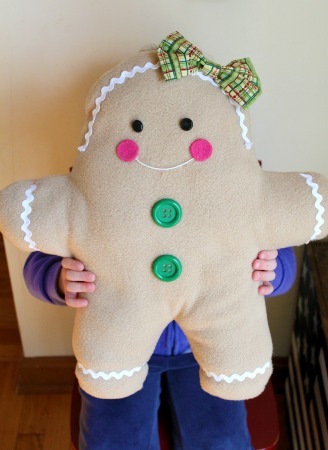 I've made stuffed gingers with paper but never a real plushy but now I am so inspired to! I'm sorry I haven't commented in awhile. I've been reading your blog on my NookColor via an App. While I love how easy it is to access my blogs it does make commenting more difficult. Happy Holidays!